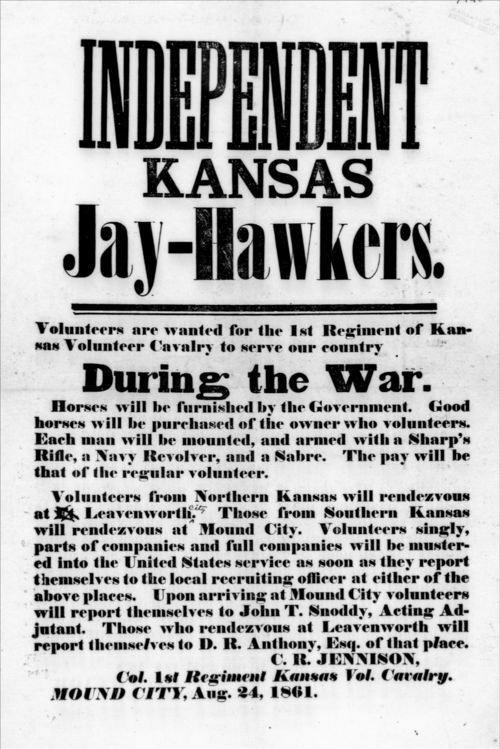 Broadside recruiting men for the Independent Kansas Jay-Hawkers, 1st Kansas Volunteer Cavalry. Charles R. "Doc" Jennison was colonel of the regiment and, as a consequence of his position, was responsible for the recuritment of the men under his command. This broadside from the Independent Kansas Jay-Hawkers can be used to give students an idea of how men were recruited for military service during the Civil War. While specific to Kansas, the broadside is very similar to many that circulated throughout the Union shortly after the Confederate attack on Fort Sumter in April of 1861, and might also be used to tie events in Kansas to national events.